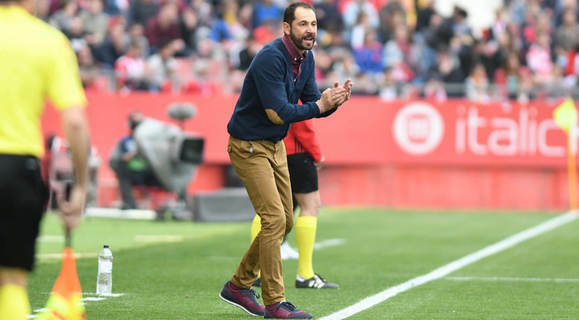 Spanish La Liga side Girona FC has confirmed that Coach Pablo Machin has tendered his resignation while Sevilla has also confirmed his appointment on a two-year contract. Machin was hugely successful with Girona after leading the side to a 10th place finish in the La Liga in their maiden season following promotion from Segunda Division. Machin joined Girona at the end of 2013/14 season and managed to save the club from relegation and later guided the Catalan side to La Liga promotion after the 2016-17 season. His philosophy of sticking with the same starting eleven made it hard for Kenyan international Micheal Olunga to showcase his full potential. Meanwhile Real Betis are the latest club linked with Micheal Olunga. The tall striker scored in the last game for Girona this season, a friendly against US Figueres. Another Spanish side Real Sociedad are also rumored to harbor interest. Olunga joined the Spanish La Liga on 1 September 2017 from Chinese Super League side Guizhou Hengfeng Zhicheng FC on loan. In his debut La Liga season, Olunga clocked 426 minutes from fourteen appearances, four starts and ten as a substitute. He scored three goals in the La Liga.